Canada's Manitoulin Island-the largest freshwater island in the world-is now home to a 60-MW wind project that is partly owned by First Nations groups. Canada's Manitoulin Island, located on Lake Huron, is near an area where a popular television series called "Adventures in Rainbow Country" was filmed, but the largest freshwater island in the world has now set course on a new adventure-wind power. encourage production of renewable energy under Ontario's Green Energy Act. John Brace, Northland CEO, says the project would not have proceeded without support from Ontario's FIT program. With the first commercial power from the project sold this past spring, this brings a highly desirable project for the company on line and justifies the effort put forth for over a decade to bring all interested parties on board, from the province to the First Nations and concerned environmental groups. It is also a highly desirable project from a wind resource perspective. "If you look at wind maps, it's no surprise that it's on large bodies of water where the wind is the best, and Manitoulin is on a large body of water," says Brace. "Also, the physical configuration of Manitoulin and the mainland helps to funnel some of that wind and create an excellent wind resource." Northland has been collecting wind data from meteorological towers on the island since 2003. Recognizing the quality of this resource, the company developed the McLean's Mountain project to a capacity as large as the local power transmission infrastructure could manage. Brace says the participation of First Nations in the venture helped smooth the way for the project to proceed. MMP consists of six First Nations groups, and Brace says it was MMP who actually approached Northland about forming a partnership to pursue the project. Art Jacko, manager of Lands and Resources with the United Chiefs and Councils of MnidooMnising Communities (UCCMM), which owns MMP, says UCCMM chiefs examined all forms of energy and determined that renewable energy has the least impact. They chose to explore opportunities in renewable energy within their traditional territory, and UCCMM approached Northland Power on a business partnership proposal. Now that it has the McLean's Mountain wind development experience under its belt, UCCMM is investigating other potential renewable power investments, within and outside of traditional First Nations territory. "The question we asked oursel-ves is, 'why can't we do this in other Canadian provinces such as Alberta, Quebec, or Canada's Maritime provinces?" Jacko says. "Why can't we be like Northland Power or other companies who are out there doing this very thing? We're now taking some steps to move in that direction. Northland Power started off with two guys not too long ago, and now they have grown into a very well established and respected company." Although the wind farm is located on private property, it is within First Nations traditional territory, which generated dialogue between the partners about siting the wind turbines to ensure that no traditional activities would be negatively impacted. This exercise proved fruitful as it resulted in a determination that the original site plan was sound. Northland also conducted an extensive archeological survey of the area to again ensure that wind turbine locations did not disturb important historic sites. MMP's goal was to generate income and jobs for their communities. A number of First Nations contractors were hired to construct the 2,000 hectare wind farm that consists of 24 General Electric 2.85-103 wind turbines. Northland already had experience partnering with another First Nation on a project in northern Ontario. "That became the impetus for us to be interested in doing more and more First Nations partnerships," says Brace, adding that they were approached by MMP, "with a well thought through and entirely reasonable and appropriate proposal on how we would work together on the project." Initially, the First Nations were opposed to the wind project but for unrelated reasons, specifically to voice their displeasure at the lack of progress on other agreements they had with the Ontario government.However, over time and by tapping into financial resources available to them, they began to realize how participating in the wind project would benefit them. Jacko says that MMP has an "excellent" relationship with Northland Power, with communication taking place almost daily between the partners to address any concerns that might crop up. He adds that part of the reason the relationship has developed is because the First Nations group has been actively involved throughout the McLean's Mountain wind farm development. "We didn't sit on the sidelines after the agreements were signed," says Jacko. "We were actively involved prior to, and during, construction, and we will continue to be involved daily during operations for the next 20 years." Ontario and a well-traveled area for the holiday crowd. "It's not a remote, sparsely populated, small island that is covered by wind turbines and nothing else," Brace says. "It's actually a pretty large island with a reasonably substantial population and infrastructure in place already." Northland listened to all concerns expressed about the project and did whatever it could to mitigate them, realizing that it was impossible to satisfy everyone. "Interestingly, we did a survey of recreational boat users during a long weekend, and it showed that in a majority of cases, they actually felt that having wind turbines there was a good thing because it meant that the environment was better off, and whatever energy they used on the island might actually come from green power," says Brace. H.B. 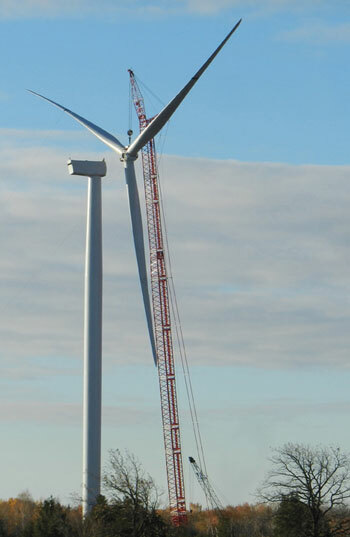 White Construction, a wholly owned subsidiary of Infrastructure and Energy Alternatives LLC (IEA), was Northland's engineering, procurement, and construction (EPC) contractor on the McLean's Mountain wind farm. Among the biggest challenges for White Construction was delivering the hardware to the island, as its connection to the mainland is through a single-lane swing bridge. It took careful planning and coordination to ensure that traffic flow was not significantly impeded by component delivery. "When our turbines were ready for delivery towards the end of last summer, the Ontario Provincial Police wouldn't let us move the turbines on the roads and the bridge because they were concerned about its impact on tourist traffic," says Brace. "So we had to wait until after the Labor Day weekend to start delivering." In addition to the Manitoulin Island project, Northland Power has developed several other wind projects in Canada, such asthe 100-MW Mont Louis wind farm in Quebec (above). The company is also developing a huge project in Europe, the $4.2 billion 600-MW Gemini project, the largest wind power project in the North Sea. Interconnection to the power grid also presented some challenges as it was necessary to install an underwater export cable across a channel to another island. "There was a short window in which it would be possible to do that work because of marine ecosystem issues," says Brace. "So we had to make sure that we were ready and able to lay our cables." In addition to White Construction as the EPC contractor and GE as the wind turbine supplier, Powertel provided the 150 kilovolt overhead transmission system; Belanger Construction trenched the power cable collector system; the Kerite Company provided the underwater cable with installation provided by Durocher Marine; and ABB supplied the power transformer. The aggregate and concrete were supplied and installed by local contractors, many of whom were owned by First Nations. Construction took about a year, with commercial production starting in May. The EPC contractor was faced with winter construction, and Ontario encountered a few significant ice storms last year; however, there was no damage done to the McLean's Mountain infrastructure, and the project was delivered on time. White Construction is also currently installing a number of ground-mounted solar power projects for Northland Power. GE is providing operations and maintenance through a 10-year service agreement for the McLean's Mountain wind farm, which entails round-the-clock remote monitoring and diagnostics through their global wind monitoring center in Schenectady, New York. Northland has hired staff locally to look after onsite maintenance that is outside GE's scope. Prior to construction, the company had to conduct a thorough environmental review as to how the project might impact the local flora and fauna, and a recognized concern was how it might impact a bird species called the Bobolink. "We've had to establish some permanent Bobolink habitat outside of the property to mitigate any impacts from construction of the wind farm," Brace says. The island geology is described as largely limestone with very thin topsoil, if any, in places. Location of wetlands was an issue, so Northland had to be careful selecting its site locations, where it built roads, and how it routed its transmission lines. Noise studies were also conducted in advance of turbine site selection. 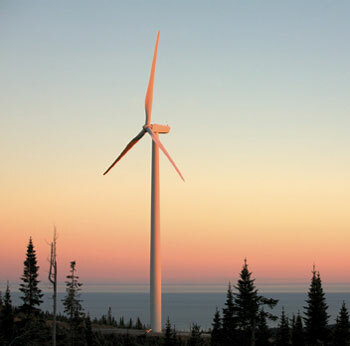 As Northland contemplated various iterations of the McLean's Mountain wind farm, it encountered an entirely new renewable energy approvals process through the Ontario government. "There were a lot of teething pains within that process in terms of how to execute an application and get it considered and approved," says Brace. "That was certainly the most uncontrollable issue for us in terms of sticking to a schedule." However, he adds that this situation was by no means a failure on the part of the province but simply a case of the government being "swamped" with applications, with an enormous quantity of work required on the part of the province. There is no doubting Ontario's enthusiasm for renewable energy, with its desire to achieve multiple goals. One is greater proliferation of 'green power' in conjunction with plans to decommission power production from coal-fired power plants. Another is to create an industry and jobs built around installation of renewable energy. "When you put all that together along with the availability of long-term contracts, it became a good place to consider for viable and economic projects," says Brace, adding that having a sense that there is long-term political support for renewable energy development is an important factor when considering where to develop projects.